Kerala lottery is a big initiative launched by the government of Kerala over 50 years ago. The idea is initially brought forward by the finance minister of Kerala state government P.K. Kunju Sahib since 1967. The main aim of the scheme is to provide job opportunities to the unemployed and the government to attain an economic stability by obtaining finance. Many people have been able to fulfill their responsibilities by winning the prize of Kerala lottery. "Karunya Plus Lottery Result KN-261"
The seven daily lotteries are Pournami, Win Win, Sthree Sakthi, Akshaya, Karunya Plus, Nirmal and Karunya on Sunday, Monday, Tuesday, Wednesday, Thursday, Friday, and Saturday respectively. Kerala lottery result live updates will be published at 3 pm on our website www.keralalotteries.net and the official result will be updated at 4 pm. Name of Lottery & Draw No. 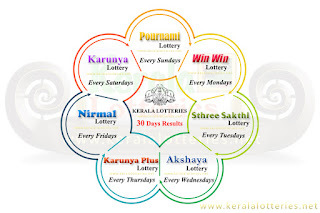 Kerala lottery consists of seven weekly lotteries with different prize structures. The Kerala lotteries department held the draws every day. The daily draw is held at Gorky Bhavan Near Bakery Junction, Trivandrum at 3 pm. The Kerala government gathered the very large amount of money through Kerala lottery and spend it for many development purposes as well as for charitable contributions.